Joseph Cheong was actually born in South Korea however at just the age of six he moved with his family to the US. 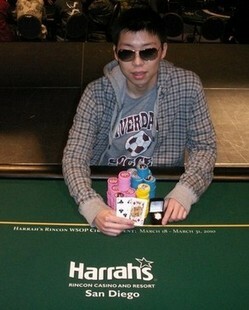 He is one of the few poker players that didn’t drop out during his studies to play full time and holds a B.S. in Psychology and a Joint B.A for Math and Economics which helps him be a very mathematical player. Joseph started playing professionally in 2007 and has seen a little sucess. Joseph has had a good run in the past two years at the World Series Of Poker. He has 4 World Series Of Poker Circuit cashes the biggest of which is when he won a $300 event for just over $17k in prize money. In 2010 Joseph really started to dent the World Series Of Poker cashing two more 6 max events with the larger being a $5k buy-in for just over $17k. All in all he has made around $20k prize money on the WSOP circuit events and $30k at the WSOP.This is all about to change considering Joseph has just secured his place in the November Nine. Joseph is one of the 2010 November Nine and is currently 3rd in chips holding 23 million with first holding 65. This is clearly the biggest tournament and prize pool Joseph Cheong has played in during his poker career. This means he might not be used to playing at such high stakes so could make crucial mistakes and with such massive jumps between the prize money for each place who can blame him. You should definitely not write him off though because he is third in chips and in poker anything can happen.